1.Nautiloid. This straight suture pattern is exhibited in cephalopods from Paleozoic to recent times. 3.Ceratite. This curved and crenulated pattern is found on cephalopods from the late Paleozoic to the early Mesozoic. 4.Ammonite. This highly crenulated pattern is found only on Mesozoic cephalopods. 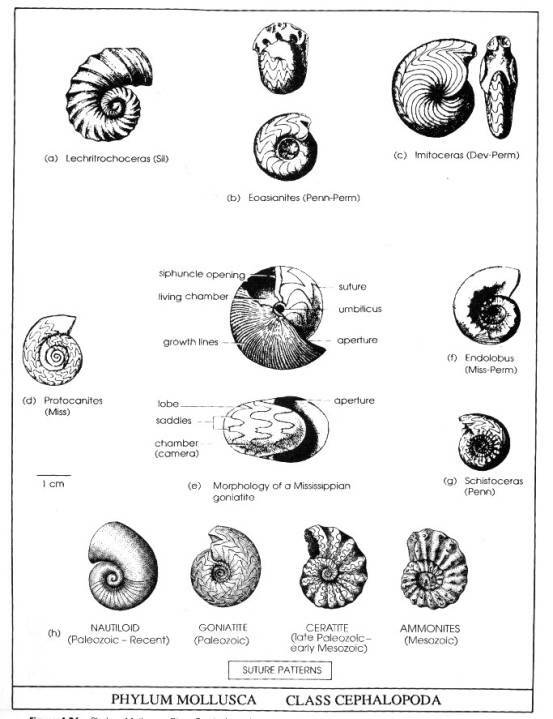 Ammonites became extinct with many other groups of organisms at the end of the Mesozoic. Belemnites were relatives of the modern squid and possessed cigar-shaped internal calcite supports that are found as fossils in late Mesozoic and early Cenozoic strata.